When Amy Rogers from WFAEats: All Things Food and Culture (the online food magazine for Charlotte's NPR station) contacted me about writing an article, I couldn't have been more ecstatic. I would actually be published somewhere other than my own blog! I was so appreciative of the opportunity and set to work, thinking of what would be of interest to people in Charlotte, the entire state, and even the South! I decided I would write an ode to one of my favorite foods in the world: Pimiento Cheese. 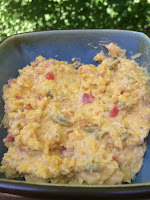 And not just any pimiento cheese - my grandmother Sally's. This of course meant tons of research (read: eating lots of her pimiento cheese) to make sure I had the story and more importantly, the recipe, correct. The best pimiento cheese you will ever eat. I'm so flattered and excited that WFAEats published my piece, and I'm so proud to share it with y'all! Click here to read my post on the WFAEats website!